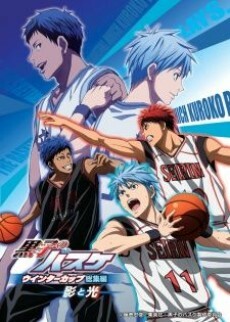 First of three compilation films of the Kuroko no Basket franchise. The first match of Seirin vs Touou Gakuen at the Winter Cup. Seirin swore they would get revenge from the Inter-High, but Aomine's talents grew even stronger and Kuroko's new move is seen through. After having all of his efforts denied by his former light, Aomine, Kuroko is benched and faces humiliation. Seeing his partner like this, something almost beast-like awakens within Kagami, and he challenges Aomine. Aomine had lost almost all sense of fighting, until he and Kagami both intensely face off with each other as they go into the Zone.